As one of the founding fathers and first elected presidents of the United States, George Washington may be one of the most recognized figures in American history. Many myths and legends surround him, but just who was the man behind the trademark ponytail and false teeth? George Washington was voted into office unanimously in 1788 and again in 1792; during his two terms he successfully brought a new nation together through the creation of a strong and balanced government. He oversaw the drafting of the U.S. Constitution, and during his presidency he established many of the presidential policies still in place today, including the oath of office, presidential salary, and two-term presidential candidacy limits. In addition to being the first U.S. president, Washington held various prestigious roles in the British forces and Continental Army before his presidency. He was also rich. In fact, his family owned tobacco plantations and, like most wealthy plantation owners, Washington and his family owned slaves. As a young man, Washington began his career as a surveyor and soldier in the colonial forces and was quickly promoted to senior officer. Later, during the establishment of the Continental Army, he was named commander in chief and became one of the key participants in bringing success to the patriot cause during the American Revolution. 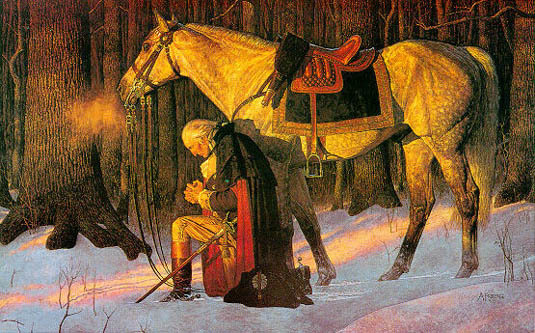 His career as commander in chief had him directly leading troops against the British forces. And although he lost many battles, at one point being defeated and almost captured in New York City, he became a symbol for the American movement against the British crown. When the fledgling country went on to win the American Revolution, Washington became the first — and only — president to be elected unanimously by the Electoral College. In his personal life Washington was recognized as one of the wealthiest men in Virginia. His marriage to 28-year-old Martha Dandridge Custis, a widow who was wealthy in her own right, helped to secure his position in Virginia’s upper-crust society. Together the Washingtons raised her two children from her previous marriage and settled into life as plantation owners in Virginia, where Washington enjoyed attending dances, theater, cockfights, and participating in fox hunting. He also expanded his tobacco empire into other commodities including wheat, horse breeding, and whiskey production. Washington’s political career began when he was elected to the Virginia provincial legislature in 1758. During this time he became involved in the growing resistance movement by the colonialists and early protests against taxation by the British government, including the 1765 Stamp Act and Townshend Acts. When the colonies went to war in 1775, following the Battles of Lexington and Concord, Washington put on his military uniform and was named commander in chief of the Continental Army, created on June 14, 1775. One of the most enduring myths surrounding Washington is his chopping down of a cherry tree during his youth and the famous phrase “I cannot tell a lie” when confronted by his father for the deed. This story was probably invented by his biographer Parson Mason Weems to demonstrate the factual heroic and moral qualities that made Washington an impressive figure in his adult life. Washington lived in Virginia during his entire presidency and is the only president to date who did not live in the White House. In fact, the White House was not completed until after his death, but he did play a key role in its design. After the American Revolution, Washington’s attitude toward slavery, which was common at the time, began to change drastically. He was the only president to free the roughly 124 slaves in his care upon his death. Additionally, many of his former slaves were cared for by the Mount Vernon estate for decades after his death.